Assign a library reference. The LIBNAME statement assigns a libref to the SAS library that contains a permanent SAS catalog. List the entries in a catalog and route the output to a file. The CONTENTS statement creates a listing of the contents of the SAS catalog PERM.FINANCE and routes the output to a file. Change entry names. The CHANGE statement changes the name of an entry that contains a user-written character format. (ET=) specifies the entry type. Process entries in multiple run groups. The MODIFY statement changes the description of an entry. 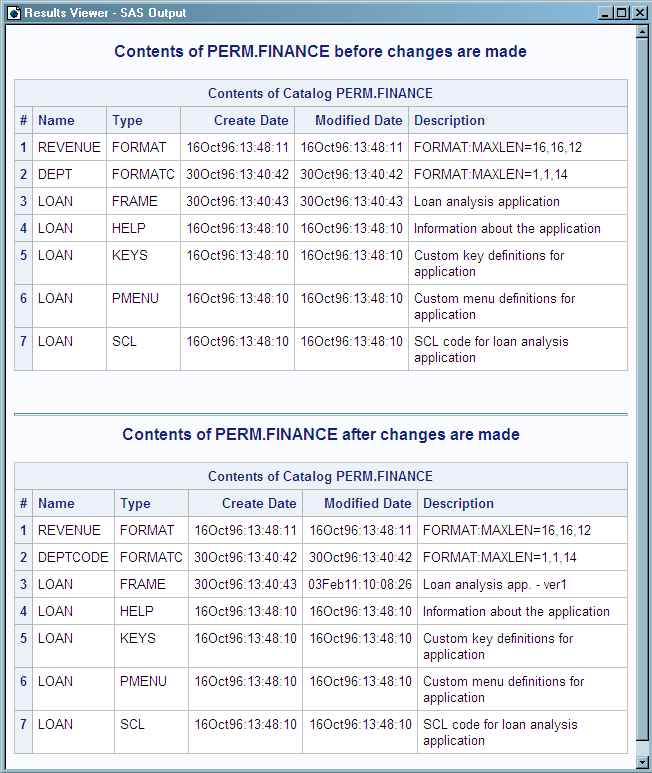 The CONTENTS statement creates a listing of the contents of PERM.FINANCE after all the changes have been applied. QUIT ends the procedure.